This luxuriant Palekh box has been painted by the famous painter, Nina Bogachyova. She was born in 1941 in the village of Ilinskaya in Ivanovo region, 300 kilometers northeast of Moscow. She currently resides in Palekh, as a well-established Palekh artist. The themes of her works are for the most part folklore and genre scenes. 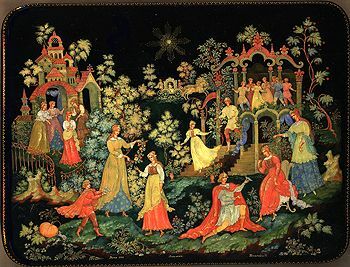 The box depicts some moments from the well-known classic tale of "Cinderella" written by Charles Perrault in 1697. In the center of the composition we can see the episode when Cinderella's godmother transforms her into a gorgeous Princess. The scene depicted a little above shows Cinderalla's stepmother and stepsisters scolding her and ordering to work hard. In the right upper corner of the composition Bogachyova has painted Cinderella escaping from the ball arranged in the king's palace, and the Prince trying to overtake her. The right bottom corner of the composition depicts the Prince asking Cinderella to try on the crystal shoe. The composition is painted in various shades of brown, red, orange, blue and green tempera paints. The details are intricately enhanced with lustrous gold paint. The edges of the lid are adorned with a simple pattern composed of gold beads. The box's sides are decorated with complex gold leafy patterns. The box is constructed from paper-mache. The exterior of the box is painted with black lacquer while the interior is completed with dark red lacquer. A hinge is fastened to the top of the composition and the box rests on four legs. The work is signed with the artist's name, Palekh, the title and the year of 2009.